Hoffners Training Academy provides training and certification. Lesson plans are reviewed and updated annually. Brian Hoffner is an expert witness. The certifications provided are supported by his testimony to the content of the lesson plans and the actions of his students. Brian, a Master Peace Officer in Texas, has been in law enforcement for more than thirty years and a law enforcement trainer since 1985. He is known for his expertise and dynamic instruction of innovative techniques. Over the years, Brian's Training program has evolved into one of the top in the nation. "Intensity with a foundation of stone, streetwise, and logic" has been used to describe his program. His philosophy is that every person is responsible for his or her own life, the choices that they make, and responsible for their own safety and well being. Losing the fight is not an option, we must refuse to be a victim and take pride in our ability to manage our life, therefore Brian's training is a program of self-improvement that goes well beyond defending your life. Brian's positive attitude combined with his incredible ability to teach and motivate provides the student with increased skill, confidence, and self-esteem. What he teaches are not just fighting skills but, skills for life and any fight that life may bring. Many students have reported that Brian has completely transofmred them to a life of confidence and success. 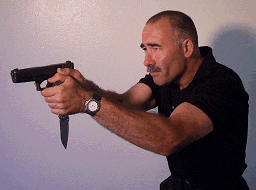 Brian's diverse training program includes the use of empty hand defense, folding knife, pistol, shotgun and rifle. Mindset, safety, manipulation, and tactics are emphasized when training with all weapon systems. He has combined his years of knowledge and skill along with his Black Belt in the art of Goju Ryu and founded the reolutionary and popular SoSu Program. SoSu is an acronym for "sights on - slack up", the incredibly intense micro moment when life and death decisions are made. SoSu is a program that makes the modern warrior out of the student with intense training of mindset with empty hands, knife, pistol and long gun. Brian is very proud of this program and would fight with his SoSu Warriors to the gates of hell. He is currently a full time senior firearms instructor, and defensive tactics instructor for the nation's fourth largest police department and continues to deliver holster products that are second to none and provide training on a national level with his intensive and revolutionary training program. Don't miss it! F.B.l, A.T.F., U.S. Military, Houston Police Department, Dallas Police Department, Austin Police Department, Mid South Institute John Shaw, Defense Training International John Farnam, Glock Police Services Division, Peter Tarley, Thunder Ranch, ASP, Sig Arms Academy, Tony Blauer Defense Systems, Cold Steel lnc., Heckler & Koch International Training, Yavapai Academy Louie Awerbuck, CRTC Bennie Cooley, Brian Felter, Dennis Tueller, IALEFI and Enrique Tauzon.